The traditional Indian barber is probably your best bet for a fast, no frills and affordable hair cut these days. Indian Barbers have definitely held a unique role in our Malaysian history, and still provide services that are unavailable elsewhere. Unisex hair salons simply don’t cut it (forgive the pun) when it comes to providing pampering services available only in these traditional Indian barber parlors. Travelers, backpackers here’s a tip – if you ever land on KL shores, here’s a great time to get that crown shorn, for cheap. 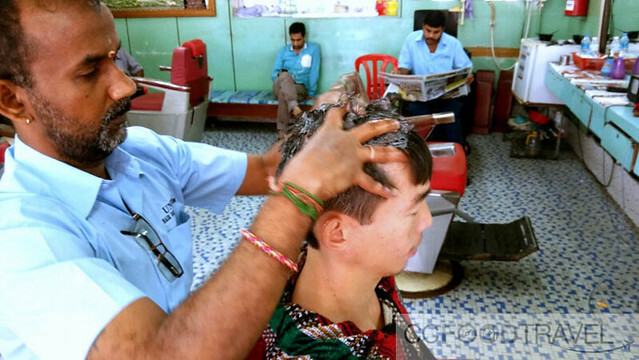 Of course if you go for the full monty – a traditional shave, cleaning facial and amazing Indian head massage, the price goes up accordingly, but generally a haircut costs only RM13-15 (USD3.60). In this vid, we see @tummyleejones getting a head massage, after he has had his haircut. The cut cost him RM13, and the massage RM30. Some folk will tell you that the best sort of head massage, is the Indian head massage. But as with most skilled services, it really depends on the person. Some places give great massages, but some less good. Anyway this practice has been a part of Indian culture for centuries and the pressing of pressure points is known to be used for manipulating energy channels. The goal is to clear blocks in these energy channels and thus removing ailments and sometimes even healing diseases. But if you ask @tummyleejones, he just likes it because he is a sucker for head massages and loves the pampering. You can almost fell your own head tingle watching him get his crowning glory pampered in this vid… enjoy! Been there, done that…but I cannot stand the smell of the cologne that they use on customers. Really? Ask for no cologne la then! Hi there, may I know the location of this barber shop? Thanks! This one is in SS3, next to Ah Soon Kor restaurant. Just use google maps.